Full back Scott Griffiths will play through the pain barrier in a bid to help Hatters reach the League Two play-offs this season. Speaking after the 1-0 win over Tranmere on Monday, the 29-year-old admitted he would have to go under the knife to cure his long-standing hernia problem. But after talking to the surgeon, Griffiths has now had a change of heart, as boss John Still said: “He played Saturday, had a good rest, was going into have the op yesterday but after the game, felt remarkably good. “So in consultation with the specialist, it came to a point where he can probably get to the end of the season, even if we’re in the play-offs. 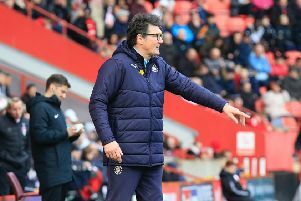 “It can’t get worse, it’s whether he can deal with the pain side of it and he just feels that we have a chance of the play-offs, so he wants to be around for that, wants to be involved in that. “He feels that it can be managed at the moment, because of the amount of rest he can get. “Certainly, Saturday to Saturday will not present him any problems, whether it’s a Tuesday and a Saturday, we’ll have a look at that. “The plan is now to have the op as soon as our season finishes, unless it became so painful that he can’t continue. “The surgeon seems to feel he’s over the worst part of it and they’ve found the right medication for him too. “He couldn’t believe how good he felt on Saturday and after Saturday when the effects of the tablets have worn off as you get a bit sore.